LoyaltyLion is a data-driven loyalty and engagement platform trusted by thousands of eCommerce brands worldwide. Merchants use LoyaltyLion when they want a fully customized loyalty program that is proven to increase customer engagement, retention and spend. 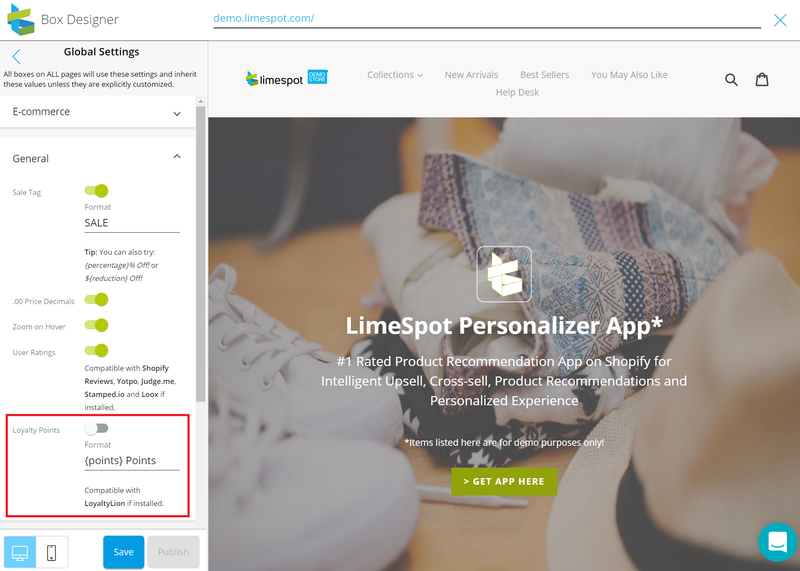 LoyaltyLion and LimeSpot’s integration allows you to display bonus points for selected products within your LimeSpot AI-driven targeted recommendations. Note: To benefit from this integration, you need to have both apps installed and activated. Go to your LimeSpot Personalizer account, turn on Loyalty Points on Global Settings > General in the Box Designer.